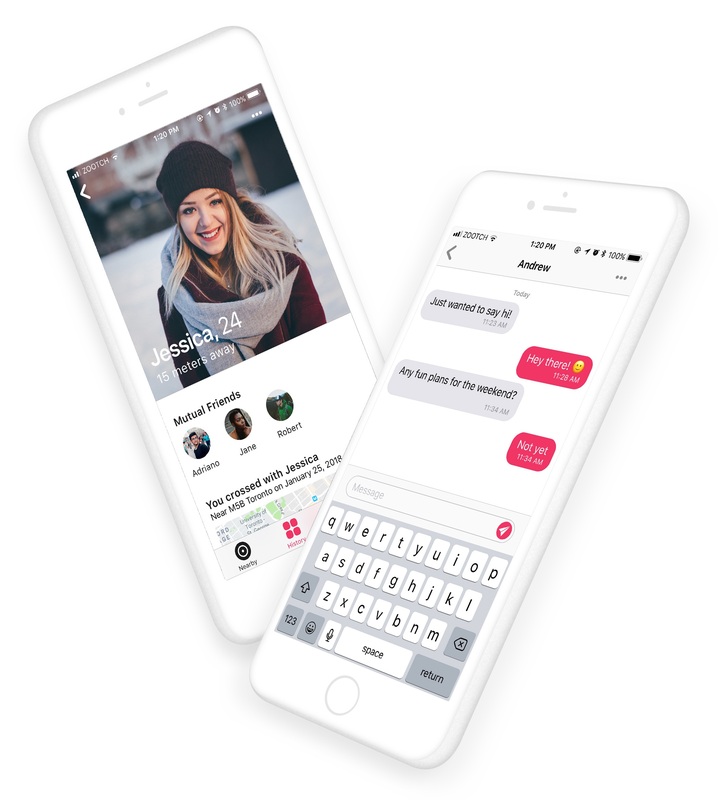 ZOOTCH is a unique smartphone app that lets you instantly communicate with people close by, even if they’re not in your contact list. In a restaurant, in a park, at the library, in a classroom... even in a crowded bar! There’s no place off limits. Send a message to that interesting looking person sitting across from you on the bus. Get assignment information from a fellow classmate three rows up. Or ask everyone at the bar if the new tap beer is worth trying. Expand your network. Make friends out of strangers. With ZOOTCH, everyone is in reach. Everywhere you might find yourself there’ll be an opportunity to connect with the interesting people around you. in your direct proximity and start discovering new people. people in the same room as you unless they’re on it? ZOOTCH takes friendly chat to another level. No name. No contact info. No need! If you want to chat with someone you see, just open up the ZOOTCH app on your phone. With a few taps of your finger, you’ll be instantly connected and ready to send a message. Start a private conversation with the person enjoying a cappuccino at the next table. Or message all the people in line at the fast food joint to help you decide between the burger and the crispy chicken. 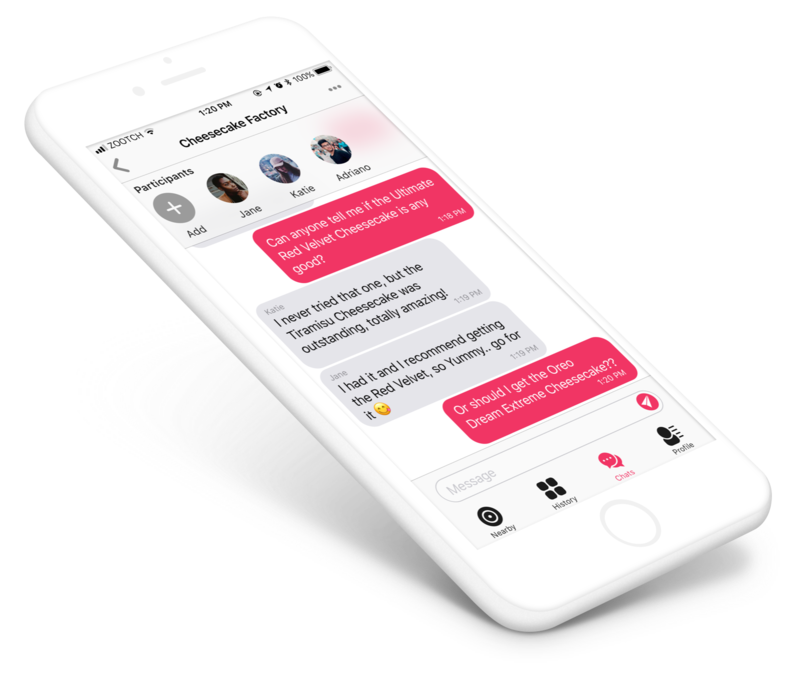 ZOOTCH makes it easy to chat one-on-one or in groups. Whether you’re shy, curious, embarrassed or eager to meet new people, introductions have never been easier. There are no monthly subscriptions or in-app purchases that allow you to unlock premium features. ZOOTCH comes premium right out of the box… for FREE! Even though ZOOTCH is free, we don’t bother you with ad popups either. Just chat and enjoy! Concerned about your privacy? Yeah, we do! That’s why everything you post to ZOOTCH stays 100% secure and encrypted. Rest assured, no other company or government agency has access to your data. Still here? Download the app and start ZOOTCHing people around you!